Jian Xinyun, Deng Zixin, Sun Yuhui. Aminoglycoside gentamicin research: fundamental progress and new application prospects. Chin J Biotech, 2015, 31(6): 829-844. 图1 庆大霉素C组分化学结构 Fig.1 Structure of gentamicin C complex. 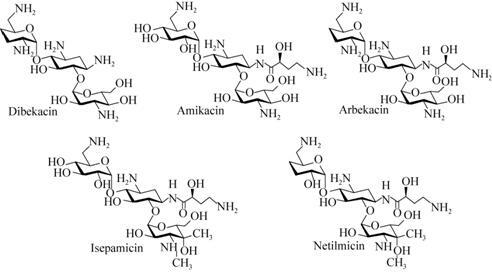 A: amikacin: Ap: apramycin; B: buirosin; D: dibekacin; G: gentamicin; I: isepamicin; K: kanamycin; L: livdomycin; N: netilmicin; Ne: neomycin; P: paromycin; R: ribostamycin; S: sisomicin. 图3 氨基糖苷类抗生素钝化酶与卡那霉素B的相互作用位点 Fig.3 AME target sites on kanamycin B. 图4 庆大霉素生物合成基因簇 Fig.4 Gentamicin biosynthetic gene cluster. 图5 目前已知的庆大霉素生物合成途径 Fig.5 Currently confirmed gentamicin biosynthetic pathway. 图6 第二代半合成氨基糖苷类抗生素衍生物结构 Fig.6 Structure of the second generation of aminoglycosides. Weinstein MJ, Luedemann GM, Oden EM, et al. Gentamicin, new antibiotic complex from Micromonospora. J Med Chem, 1963, 6(7): 463-464. Okachi R, Kawamoto I, Takasawa S, et al. A new antibiotic XK-62-2 (Sagamicin). I. Isolation, physicochemical and antibacterial properties. J Antibiot (Tokyo), 1974, 27(10): 793-800. Abrasimovskii PI, Valdimirov AV, Bartoschevich IE. Phosphate regulation of the processes of growth and biosynthesis of gentamicin in Micromonospora purpurea var. violaceae. Antibiot Khimioter, 1990, 35(1): 5-8. Wagman GH, Oden EM, Weinstein MJ. Differential chromatographic bioassay for the gentamicin complex. Appl Microbiol, 1968, 16(4): 624-627. Fourmy D, Recht MI, Blanchard SC, et al. Structure of the A site of Escherichia coli 16S ribosomal RNA complexed with an aminoglycoside antibiotic. Science, 1996, 274(5291): 1367-1371. Mathews A, Bailie GR. Clinical pharmacokinetics toxicity and cost effectiveness analysis of aminoglycosides and aminoglycoside dosing services. J Clin Pharm Ther, 1987, 12(5): 273-291. Shaw KJ, Rather PN, Hare RS, et al. 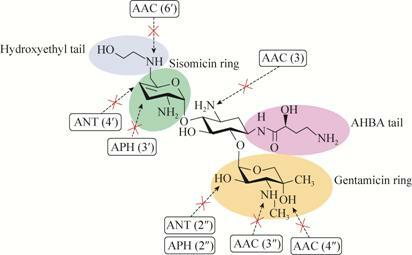 Molecular genetics of aminoglycoside resistance genes and familial relationships of the aminoglycoside- modifying enzymes. Microbiol Rev, 1993, 57(1): 138-163. Moazed D, Noller HF. 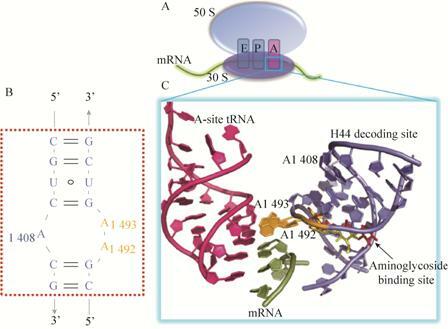 Interaction of antibiotics with functional sites in 16S ribosomal RNA. Nature, 1987, 327(6121): 389-394. Wimberly BT1, Brodersen DE, Clemons WM Jr, et al. Structure of the 30S ribosomal subunit. Nature, 2000, 407(6802): 327-339. Carter AP, Clemons WM, Brodersen DE, et al. Functional insights from the structure of the 30S ribosomal subunit and its interactions with antibiotics. Nature, 2000, 407(6802): 340-348. Ogle JM, Brodersen DE, Clemons WM Jr, et al. Recognition of cognate transfer RNA by the 30S ribosomal subunit. Science, 2001, 292(5518): 897-902. Vila-Sanjurjo A, Ridgeway WK, Seymaner V, et al. X-ray crystal structures of the WT and a hyper- accurate ribosome from Escherichia coli. Proc Natl Acad Sci USA, 2003, 100(15): 8682-8687. Green R, Noller HF. Ribosomes and translation. Annu Rev Biochem, 1997, 66: 679-716. Tsai A, Uemura S, Johansson M, et al. The impact of aminoglycosides on the dynamics of translation elongation. Cell Rep, 2013, 3(2): 497-508. Yoshizawa S, Fourmy D, Puglisi JD. Recognition of the codon-anticodon helix by ribosomal RNA. Science, 1999, 285(5434): 1722-1725. Nierhaus KH. Solution of the ribosome riddle: how the ribosome selects the correct aminoacyl-tRNA out of 41 similar contestants. Mol Microbiol, 1993, 9(4): 661-669. Shandrick S, Zhao Q, Han Q, et al. Monitoring molecular recognition of the ribosomal decoding site. Angew Chem Int Ed Engl, 2004, 43(24): 3177-3182. Kaul M, Barbieri CM, Pilch DS. Fluorescencebased approach for detecting and characterizing antibiotic-induced conformational changes in ribosomal RNA: comparing aminoglycoside binding to prokaryotic and eukaryotic ribosomal RNA sequences. J Am Chem Soc, 2004, 126(11): 3447-3453. Feldman MB, Terry DS, Altman RB, et al. Aminoglycoside activity observed on single pre-translocation ribosome complexes. Nat Chem Biol, 2010, 6(3): 244. Kaul M, Barbieri CM, Pilch DS. 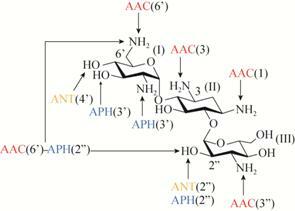 Aminoglycoside-induced reduction in nucleotide mobility at the ribosomal RNA A-site as a potentially key determinant of antibacterial activity. J Am Chem Soc, 2006, 128(4): 1261-1271. Borovinskaya MA, Pai RD, Zhang W, et al. Structural basis for aminoglycoside inhibition of bacterial ribosome recycling. Nat Struct Mol Biol, 2007, 14(8): 727-732. Wang L, Pulk A, Wasserman MR, et al. Allosteric control of the ribosome by small-molecule antibiotic. Nat Struct Mol Biol, 2012, 19(9): 957-963. Ramirez MS, Tolmasky ME. Aminoglycoside modifying enzymes. Drug Resist Updat, 2010, 13(6): 151-171. Doi Y, Arakawa Y. 16S ribosomal RNA methylation: emerging resistance mechanism against aminoglycosides. Clin Infect Dis, 2007, 45(1): 88-94. Wachino J, Shibayama K, Kurokawa H, et al. Novel plasmid-mediated 16S rRNA m1A1408 methyltransferase, NpmA, found in a clinically isolated Escherichia coli strain resistant to structurally diverse aminoglycosides. Antimicrob Agents Chemother, 2007, 51(12): 4401-4409. González-Zorn B, Teshager T, Casas M, et al. armA and aminoglycoside resistance in Escherichia coli, Emerging Infect Dis, 2005, 11(6): 954-956. Wachino J, Yamane K, Shibayama K, et al. Novel plasmid-mediated 16S rRNA methylase, RmtC, found in a Proteus mirabilis isolate demonstrating extraordinary high-level resistance against various aminoglycosides. Antimicrob Agents Chemother, 2006, 50(1): 178-184. Dunkle JA, Vinal K, Desai PM, et al. Molecular recognition and modification of the 30S ribosome by the aminoglycoside-resistance methyltransferase NpmA. Proc Natl Acad Sci USA, 2014, 111(17): 6275-6280. Becker B, Cooper MA. Aminoglycoside antibiotics in the 21st century. ACS Chem Biol, 2013, 8(1): 105-115. Weinstein MJ, Wagman GH, Oden EM, et al. Biological activity of the antibiotic components of the gentamicin complex. J Bacteriol, 1967, 94(3): 789-790. Wagman GH, Marquez JA, Weinstein MJ. Chromatographic separation of the components of the gentamicin complex. J Chromatogr, 1968, 34(2): 210-215. Wagman GH, Marquez JA, Bailey JV, et al. Chromatographic separation of some minor components of the gentamicin complex. J Chromatogr, 1972, 70(1): 171-173. Daniels PJ, Luce C, Nagabhushan TL. The gentamicin antibiotics. 6. gentamicin C2b, an aminoglycoside antibiotic produced by Micromonospora purpurea mutant JI-33. J Antibiot (Tokyo), 1975, 28(1): 35-41. Bérdy J, Pauncz JK, Vajna ZM, et al. Metabolites of gentamicin-producing Micromonospora species I. isolation and identification of metabolites. J Antibiot (Tokyo), 1977, 30(11): 945-954. Wagman GH, Testa RT, Marquez JA, et al. Antibiotic G-418, a new Micromonospora-produced aminoglycoside with activity against protozoa and helminths: fermentation, isolation, and preliminary characterization. Antimicrob Agents Chemother, 1974, 6(2): 144-149.
 lavsky J, Bayan AP, Charney W, et al. Antibiotic from Micromonospora poupurea JI-20: US, 3986929. 1975-06-09. Testa RT, Tilley BC. Biotransformation, a new approach to aminoglycoside biosynthesis: Ⅱ gentamicin, J Antibiot (Tokyo), 1976, 29(2): 140-146. Testa RT, Wagman GH, Daniels PJ, et al. Mutamicins: biosynthetically created new sisomicin analogues. J Antibiot (Tokyo), 1974, 279(12): 917-921. Kelemen GH, Cundliffe E, Financsek I. Cloning and characterization of gentamicin-resistance genes from Micromonospora purpurea and Micromonospora rosea. Gene, 1991, 98(1): 53-60. Unwin J, Standage S, Alexander D, et al. Gene cluster in Micromonospora echinospora ATCC15835 for the biosynthesis of the gentamicin C complex. J Antibiot (Tokyo), 2004, 57(7): 436-445. Kharel MK, Basnet DB, Lee HC, et al. Molecular cloning and characterization of a 2-deoxystreptamine biosynthetic gene cluster in gentamicin-producing Micromonospora echinospora ATCC15835. Mol Cells, 2004, 18(1): 71-78. Aboshanab KMA. Genetic studies on the biosynthesis of the major aminoglycoside antibiotics: isolation, analysis and comparison of the biosynthetic gene clusters for 12 aminoglycoside antibiotics[D]. Wuppertal: Bergische Universität Wuppertal, 2005. Park JW, Joong JS, Parajuli N, et al. Genetic dissection of the biosynthetic route to gentamicn A2 by heterologous expression of its minimal gene set. Proc Natl Acad Sci USA, 2008, 105(24): 8399-8404. Kim JY, Suh J W, Kang SH, et al. 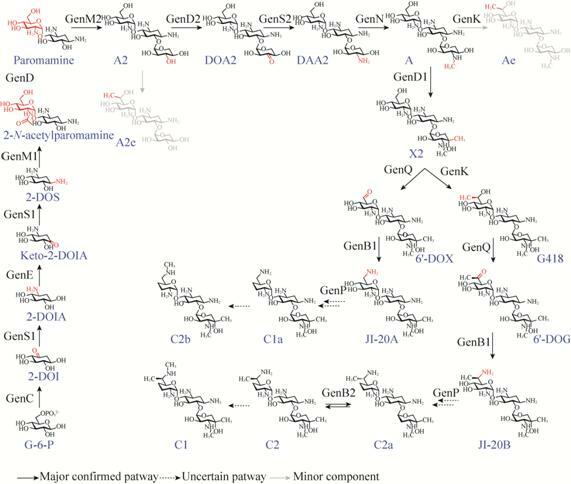 Gene inactivation study of gntE reveals its role in the first step of pseudotrisaccharide modification in gentamicin biosynthesis. Biochem Biophys Res Commun, 2008, 372(4): 730-734. Hong WR, Yan L. Identification of gntK, a gene required for the methylation of purpurosamine C-6' in gentamicin biosynthesis. J Gen Appl Microbiol, 2012, 58(5): 349-356. Li D, Li H, Ni X, et al. Construction of a gentamicin C1a-overproducing strain of Micromonospora purpurea by inactivation of the gacD gene. Microbiol Res, 2013, 168(5): 263-267. Kim HJ, McCarty RM, Ogasawara Y, et al. GenK-catalyzed C-6' methylation in the biosynthesis of gentamicin: isolation and characterization of a cobalamin-dependent radical SAM enzyme. J Am Chem Soc, 2013, 135(22): 8093-8096. Shao L, Chen J, Wang C, et al. Characterization of a key aminoglycoside phosphotransferase in gentamicin biosynthesis. Bioorg Med Chem Lett, 2013, 23(5): 1438-1441. Guo J, Huang F, Huang C, et al. Specificity and promiscuity at the branch point in gentamicin biosynthesis. Chem Biol, 2014, 21(5): 608-618. Ni X, Sun Z, Zhang H, et al. Genetic engineering combined with random mutagenesis to enhance G418 production in Micromonospora echinospora. J Ind Microbiol Biotechnol, 2014, 41(9): 1383-1390. Aggen JB, Armstrong ES, Goldblum AA, et al. Synthesis and spectrum of the neoglycoside ACHN-490. Antimicrob Agents Chemother, 2010, 54(11): 4636-4642. Zhanel GG, Lawson CD, Zelenitsky S, et al. Comparison of the next-generation aminoglycoside plazomicin to gentamicin, tobramycin and amikacin. Expert Rev Anti Infect Ther, 2012, 10(4): 459-473. Hermann T, Westhof E. Saccharide-RNA recognition. Biopolymers. 1998, 48(2/3): 155-165. Tor Y, Hermann T, Westhof E. Deciphering RNA recognition: aminoglycoside binding to the hammerhead ribozyme. Chem Biol, 1998, 5(11): R277-283. Rowe SM, Clancy JP. Pharmaceuticals targeting nonsense mutations in genetic diseases: progress in development. BioDrugs, 2009, 23(3): 165-174. Howard M, Frizzell RA, Bedwell DM. Aminoglycoside antibiotics restore CFTR function by overcoming premature stop mutations. Nat Med, 1996, 2(4): 467-469. Nudelman I, Rebibo-Sabbah A, Cherniavsky M, et al. Development of novel aminoglycoside (NB54) with reduced toxicity and enhanced suppression of disease-causing premature stop mutations. J Med Chem, 2009, 52(9): 2836-2845. Vecsler M, Ben Zeev B, Nudelman I, et al. Ex vivo treatment with a novel synthetic aminoglycoside NB54 in primary fibroblasts from Rett syndrome patients suppresses MECP2 nonsense mutations. PLoS ONE, 2011, 6(6): e20733. Brendel C, Belakhov V, Werner H, et al. Readthrough of nonsense mutations in Rett syndrome: evaluation of novel aminoglycosides and generation of a new mouse model. J Mol Med (Berl), 2011, 89(4): 389-398. Malik V, Rodino-Klapac LR, Viollet L, et al. Aminoglycoside-induced mutation suppression (stop codon readthrough) as a therapeutic strategy for Duchenne muscular dystrophy. Ther Adv Neurol Disord, 2010, 3(6): 379-389. Yao Y, Teng S, Li N, et al. Aminoglycoside antibiotics restore functional expression of truncated HERG channels produced by nonsense mutations. Heart Rhythm, 2009, 6(4): 553-560. Floquet C, Deforges J, Rousset JP, et al. Rescue of non-sense mutated p53 tumor suppressor gene by aminoglycosides. 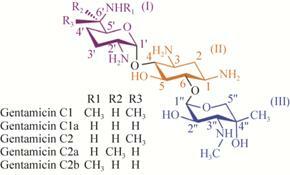 Nucleic Acids Res, 2011, 39(8): 3350-3362. Cuccarese MF, Singh A, Amiji M, et al. A novel use of gentamicin in the ROS-mediated sensitization of NCI-H460 lung cancer cells to various anticancer agents. ACS Chem Biol, 2013, 8(12): 2771-2777.